No need to buy expensive toys! All young parents want to provide their babies with enough stimulation. And often, they do a bit too much! By buying expensive electronic games or toys, trying to get them to learn letters too soon, when they are still too young, etc. While your attention and certain objects that you likely already have in your home are all the baby needs! A 6 to 12 month-old baby will spend many fun hours playing with toys placed in a laundry basket covered with a fake spiderweb made of soft yarn. Place a soft toy (like a stuffed teddy bear) on the baby's chest at about 4 months old to hold his attention for a while. Hold the stuffed toy in place by inserting some of the toy into the baby's clothing. Put a baby mirror in his bed or on his stroller and baby seat so that he can begin to recognize his own reflection. If you give the baby balls and an empty box of wipes, he can drop the balls into the box. This will teach him coordination between vision and the movements of his hands. A good game for babies aged 7 months to 1 year old. Place a baby aged 5 months and up on a nursing pillow, for example, and give him or her a plastic salad bowl filled with herbs. So he can feel and touch them. 7. Paint that does not stain. 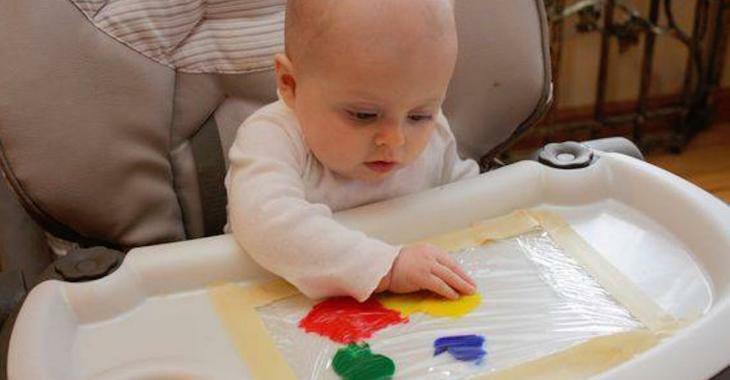 Put a few drops of paint (non-toxic) in a resealable plastic bag that you can then, for example, stick onto the baby's high chair tablet. He or she will love manipulating the colors and observing the different interactions. From the age of 5 months, babies become more sense become more developed. Blow soap bubbles, this will attract their attention and they will want to try to catch them. This will stimulate their sense of touch and vision! As soon as your baby is 6 months old, be sure to start giving him or her fruits and vegetables with different tastes and textures to get him used to a variety of foods. Here is a perfect activity for hot summer days. Take a shallow plastic pool and pour water and bubble bath into it. Baby will love touching the bubbles and trying to catch them! You can also add some bath toys. An activity for babies under one year of age. But never, ever take your eyes off a baby playing in any amount of water, no matter how small! At around 4 months, it's time to give your baby a rattle. Watch his reactions when his toy moves and makes sounds.